Every week we pull together some great recipes from Canadian food bloggers around the web featuring one main ingredient. This week, we're featuring lemons - specifically lemon desserts! If you love that mixture of sweet and tart with a burst of bright citrus-y sunshine then you will love this collection of Canadian recipes - everything from cookies to cakes, mousse, puddings and more! [Warm Lemon Pudding Cake](http://www.seasonsandsuppers.ca/warm-lemon-pudding-cake/) from Jennifer at **Seasons and Suppers** looks so inviting! [Blueberry Lemon Sour Cream Cake](http://lifeonmanitoulin.com/2014/08/blueberry-lemon-sour-cream-cake.html) - perfect with a cup of coffee - from Christine at **Life On Manitoulin**. Delightful little [Easy Lemon Lavender Bites](http://www.isugarcoatit.com/2014/01/easy-lemon-lavender-bites.html/) from J at **I Sugar Coat It**. Don't let a gluten intolerance get in the way of enjoying these [Gluten Free Lemon Bars](http://www.faithfullyglutenfree.com/2011/03/gluten-free-lemon-bars-way-lemon-bars.html) from Jeanine at Faithfully Gluten Free. Sumptous [Lemon Meringue No Bake Cheesecake](http://365daysofeasyrecipes.com/2015/12/28/86-lemon-meringue-no-bake-cheese-cake/) from Diana at **365 Days of Easy Cooking**. Wow your guests with [Lemon Mousse Trifle](http://www.rockrecipes.com/lemon-mousse-trifle/) from Barry at **Rock Recipes**. Enjoy a cup of tea with these pretty [Lemon Ginger Scones](http://www.crumbblog.com/spring-blossoms-lemon-ginger-scones-and/) from Isabelle at **Crumb**. Sweet little jars of [Lemon Mousse](http://www.kitchenhealssoul.com/2012/07/27/lemon-mousse/html) from Janice at **Kitchen Heals Soul**. Lemon syrup adds an extra burst of lemony flavour to these [Mini Meyer Lemon Loaves](http://livforcake.com/2016/02/mini-meyer-lemon-loaves.html) from Olivia at **Liv For Cake**. The classic combo of lemons and berries with [Lemon Raspberry Ricotta Cake](http://www.mykitchenlove.com/lemon-raspberry-ricotta-cake/) from Samantha at **My Kitchen Love**. A twist with **Beth Dunham** and her [Limoncello Baba](http://bethdunham.ca/updatesnews/2014/6/30/lemoncello-baba). Tasty afternoon bites with [Lemon Chia Seed Cookies](http://www.shebakeshere.com/2014/06/lemon-chia-seed-cookies.html) from Jessica at **She Bakes Here**. [Lemon Coconut Thumbprint Cookies](http://tinysweettooth.com/2016/03/02/lemon-coconut-thumbprint-cookies/) from Vicki at **Tiny Sweet Tooth**. A simply elegant [Cherry Blossom Lemon Cake with Vanilla Buttercream Frosting ](http://sheeats.ca/2015/04/spring-cherry-blossom-lemon-cake-with-vanilla-buttercream-frosting/)from Kristy at **She Eats**. Want even more lemon recipe ideas? 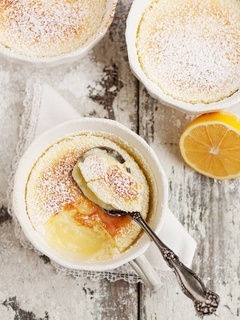 Visit our Citrus recipe board on Pinterest for loads of new sweet and savoury recipes! A big thank you to all our FBC Members who participated in this weekend's citrus recipe roundup. awesome – hope you enjoy the recipes!